In 1862, Henry Weinhard, and partner Geo. 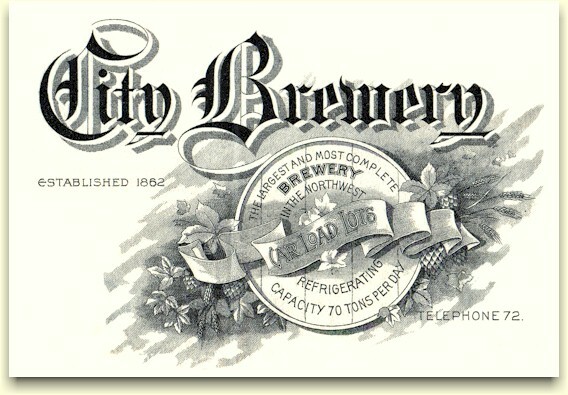 Bottler, purchased the 10 year old Liberty Brewery of Portland from Henry Saxer, and re-named it the City Brewery. 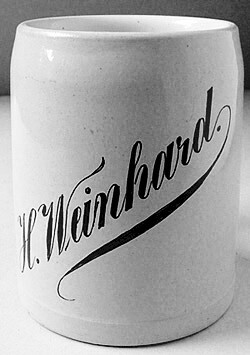 Two years later Bottler sold out and Weinhard became the sole proprietor, and remained so until his death. The history of the City Brewery has been dealt with in many publications over the years and won't be covered here. However, the period from Henry Weinhard's death in 1904, to the merger with Blitz in 1928, hasn't received much attention and is the focus of this piece. The early years of the brewery is briefly covered in Henry Weinhard's personal biography. The two names on the 1908 newspaper picture above, Paul Wessinger and Henry Wagner, were the two sons-in-law of Henry Weinhard. The following profile on Paul Wessinger is taken from the History of the Columbia River Valley From The Dalles to the Sea, Vol. III, Published 1928, Pages 782-785; S. J. Clarke Publishing Co.
"Upon on the death of Mr. Weinhard, on Sept. 20, 1904, he was made president of the company, which position he filled until his death, December 3, 1926. He was one of the executors of the Weinhard estate and when it was incorporated in 1917 he became its president. Mr. Wessinger was one of the original fifteen directors of the (1905) Lewis and Clark Exposition and served as chairman of the grounds and buildings committee, in which capacity he contributed immeasurably to the success of the fair¹." Officially known as the Lewis and Clark Centennial American Pacific Exposition and Oriental Fair, it was a worldwide exposition to celebrate the centennial of the Lewis and Clark Expedition. Opening on June 1, 1905, it ran four and a half months, closing on October 15, 1905. 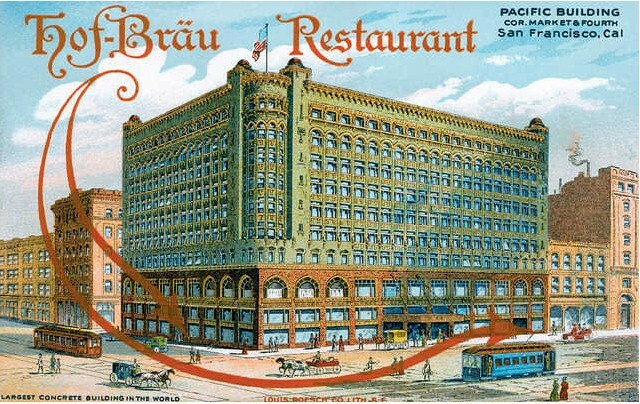 The Expo was to have a major restaurant and the Weinhard Brewery made a business arrangement with a St. Louis company, Fritz Müller & Sons, to build a German restaurant called the Bismarck Cafe. This business association with the Müllers would last over a decade. The Brewery introduced a dark draught (draft) lager, exclusively for the restaurant, called Kaiser Beer. It was a huge favorite of the many patrons of the Bismarck, and was awarded a Gold Medal by the event's judges. 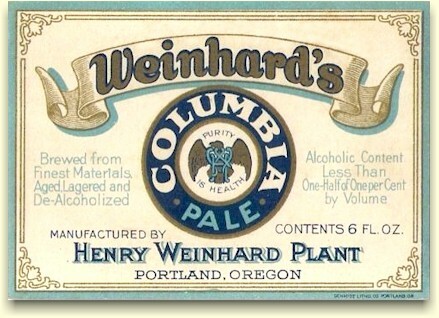 Gold medals were also awarded to Weinhard's Columbia and Export beers. The tip tray shown here was produced for the Bismarck Cafe, and has the image of the first chancellor of the German Empire, Otto von Bismarck. The Cafe also had etched beer glasses sporting the image of Bismarck (image at bottom of page). Due to the favorable response to their Kaiser Beer a bottled version was introduced on the 4th of July 1906, and was named Kaiserblume. This was a dark lager, or Dunkle, in a slightly sweet and malty, Munich style. Their bottled Columbia was a light Pilsener style lager, and the bottled Export was a pale Dortmunder style lager that would have been fuller, with more malt and less hops than the Pilsener. "...has added much to the fame of our establishment, and represents the tradition of the Vienna school, both in the brewing and malting process." This style of lager was a reddish-brown or copper-colored beer with medium body and slight malt sweetness. 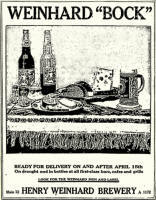 At some point prior to 1905, the Brewery had a Pale Beer - as seen in the embossed display card shown at the bottom of the page - but it didn't appear in their list of brands in an ad published in '06. 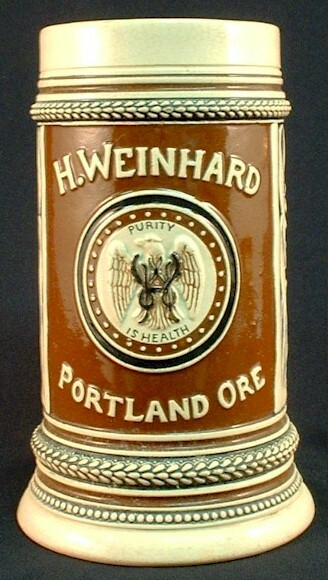 Another item that is generally believed to have been produced for the 1905 Expo is a beer stein with "H. Weinhard - Portland Ore" and the brewery logo consisting of a W. H. monogram on an eagle with the slogan "Purity is Health." 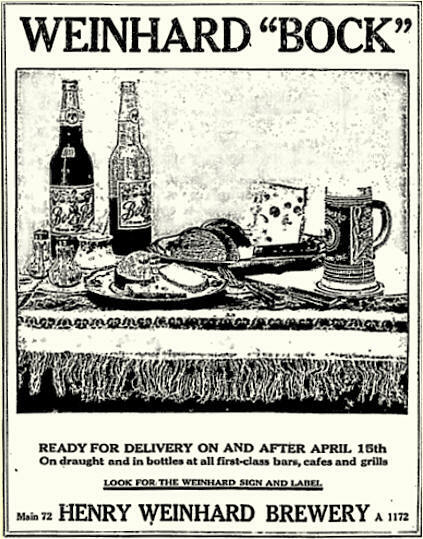 This newspaper ad (thumbnail at right) from the Oregonian, published in 1911, shows that if the stein wasn't made in 1905 it was certainly made no later than 1911. The San Francisco fire and earthquake on April 18, 1906, had a serious effect on the city's breweries and bottlers, with many plants severely damaged or lost entirely. Consequently, the city faced a severe shortage of beer. The result of the shortage was that numerous Northwest breweries received huge orders for beer. The Olympia Brewing Co. of Tumwater, WA, took this opportunity to convert their San Francisco bottling works (the Olympia Beer Co.) into a brewery, establishing the Acme Brewing Co. While Weinhard didn't go that far they did consider a larger presence in the city. 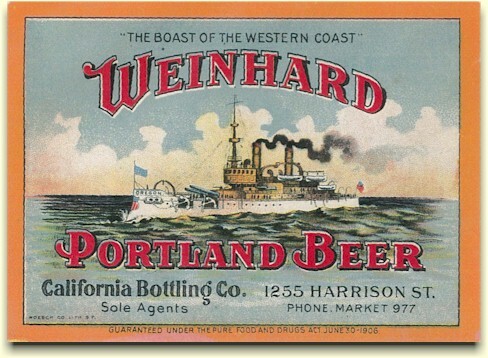 Prior to the fire & earthquake Weinhard had been shipping kegs of Columbia beer to their San Francisco agent and bottler, the California Bottling Co. However, the disaster leveled the bottling works, and had to be rebuilt. 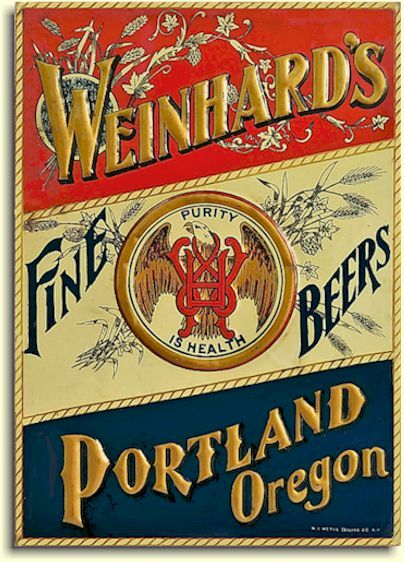 A larger bottling works was completed and the California Bottling Co. continued bottling and distributing Weinhard's products, including a brand called Portland Beer. "The Weinhard Bottling Company has been incorporated in San Francisco with a capital stock of $150,000. Those interested in the concern are M. A. Lang, William Neuman and George V. Leroi. Paul Wessinger is president of this concern, and Mr. Neuman is manager of the works." "The Weinhard Brewery of Portland, Oregon, is the most modern, since completed, have just finished building their new brew house last year. Materials used are only the finest Chevalier (white) barley grown on the Pacific Coast and malted in our own malt house at Portland, Ore., together with the best domestic and foreign hops available, and our beer contains no more than 3 per cent alcohol. For San Francisco bottling purposes, special beer is brewed named Gold Seal. The Rheingold beer, equal to any imported draught beer in the market, is handled by most important cafes and saloons in San Francisco and vicinity, as well as throughout Oregon, Washington, Idaho, Montana and Nevada. Branch office of the Henry Weinhard Brewery is located at 1255 Harrison street, San Francisco, Cal." Following the 1906 fire & earthquake, San Francisco's downtown area experienced a massive rebirth. 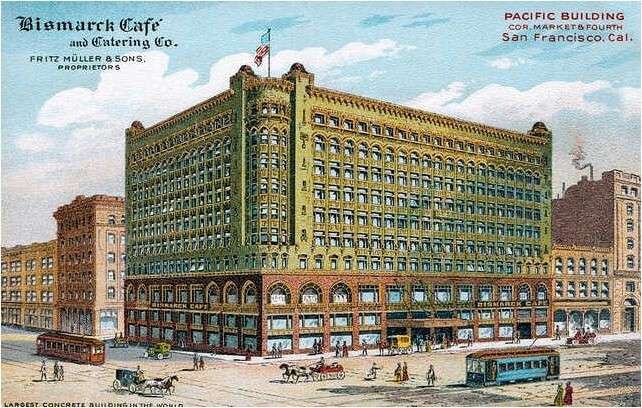 One of the most impressive structures built was the ten story tall, Pacific Building² at 4th and Market Sts. As stated on a 1908 postcard, it was the largest concrete building in the world. It was also home to an 1800 seat restaurant called the Bismarck Cafe, Fritz Müller & Sons, proprietors. It opened on May 1st, 1908. The Müller Brothers and the Henry Weinhard Brewery, again entered into a business arrangement making the Bismarck Cafe a Weinhard establishment - selling their beers to the exclusion of all others. Then, four years later, in November, 1912, the Müller Brothers sold controlling interest in the Bismarck to Henry L. Hirsch. 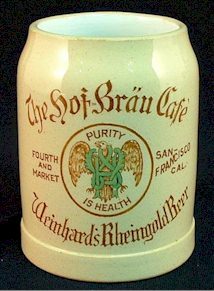 The restaurant remained the same, with only the name changing to the Hof-Bräu Cafe, and the contract with the Weinhard Brewery remaining in place, as evidenced by this stein for Weinhard's Rheingold Beer. The brewery also sponsored special events, like the 1912 Grand Lodge Reunion of the Benevolent and Protective Order of Elks (B.P.O.E.). 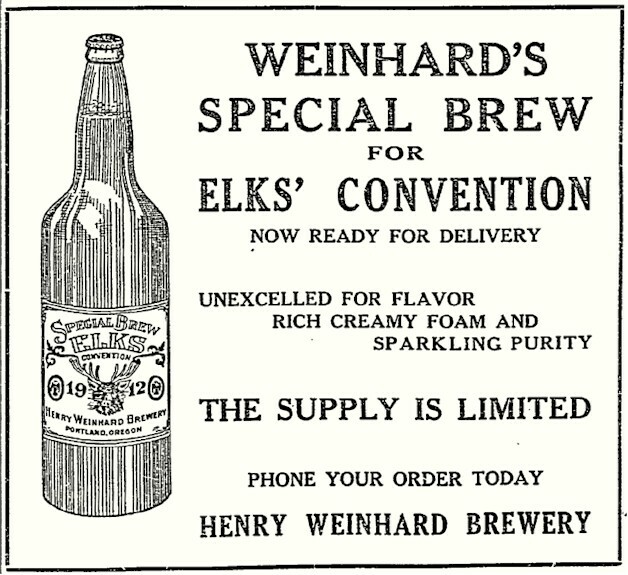 They did a bottling for the Elks called Special Brew, as shown in this Oregonian newspaper ad of July 7, 1912 (see thumbnail). The brewery did something else special for the Elks convention. 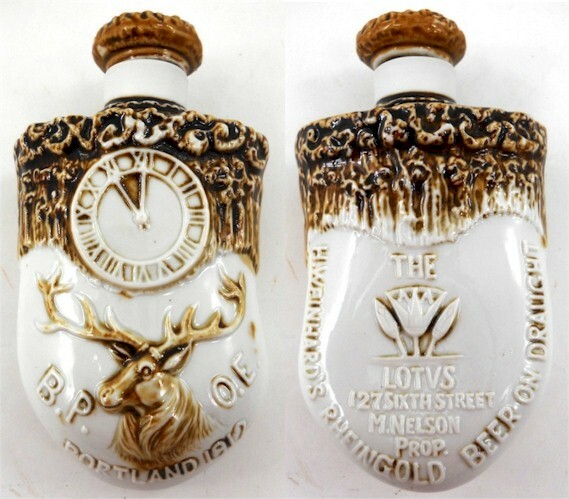 They issued a unique promotional item - a "nippers" flask in the form of an elks tooth that advertised "H. Weinhard's Rheingold Beer on draught" (see thumbnail). The flask was made by the Schaefer & Vater porcelain factory of Volkstedt-Rudolstad, Germany. 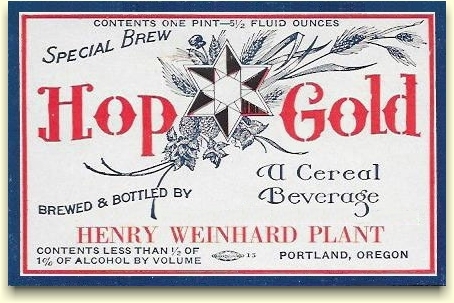 By 1913, the Brewery had dropped their Export and Portland brands, leaving only Columbia and Kaiserblume in bottles (or draught), with Standard and Rheingold as two brands that were only available on draught. 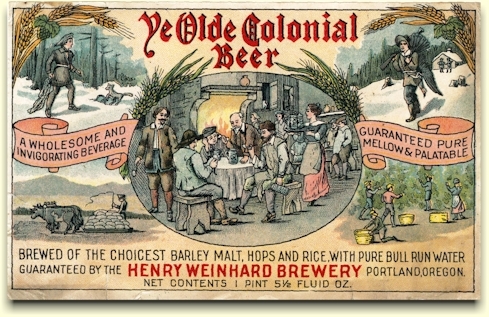 Then in February 1914, Ye Olde Colonial Beer was introduced - along with a gold rimed etched glass, sporting a design in a periwinkle blue, as a sales incentive (see glasses below). Interestingly, the water is identified on the label as "pure Bull Run water." Olympia's slogan: "It's the Water" must have resonated. Unfortunately, this and the rest of the Henry Weinhard Brewery's output of beer was soon to be halted. On November 3, 1914, the voters of Oregon approved state-wide prohibition which would take effect on January 1, 1916. The manufactures of alcoholic beverages had all of 1915 to deplete their inventories and close their plants. However, this still allowed the Henry Weinhard Brewery to take part in the Panama-Pacific International Exposition (PPIE) in San Francisco, which ran 9½ months, from February 20th to December 4th, 1915. 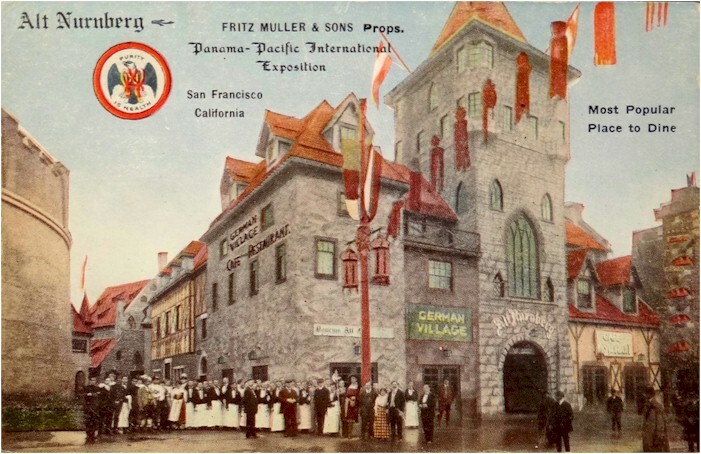 Just as they had done for the 1905 Lewis & Clark Exposition, the Brewery entered into an agreement with Fritz Müller & Sons to erect a German style restaurant on Expo grounds. And again, the brewery produced a beer exclusively for the event, with Weinhard’s Special Exposition Beer the only beer on draught at the Alt Nurnberg. 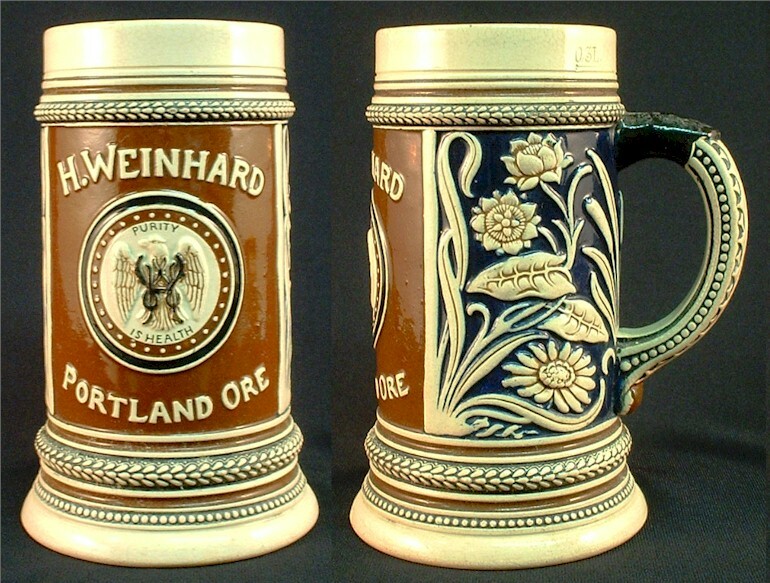 They also had a barrel shaped beer stein produced for the 1915 expo that was exclusively used at the Alt Nurnburg restaurant. 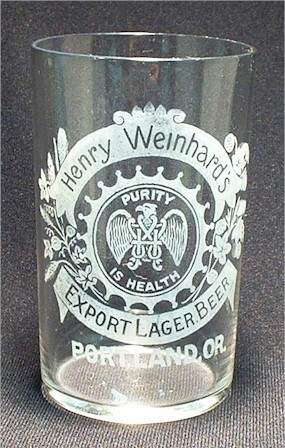 The closing of the 1915 PPIE was also the end of beer production of the Henry Weinhard Brewery in Portland. 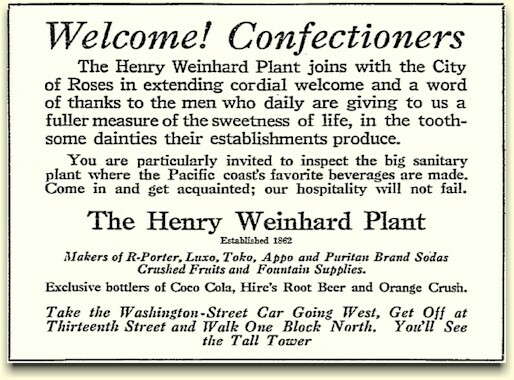 They then changed the name of the company to the Henry Weinhard Plant. , In 1916 they began the production of two near-beers called, Golden Nectar, and Amber Nectar. They also began making soft drinks, and fruit juices. 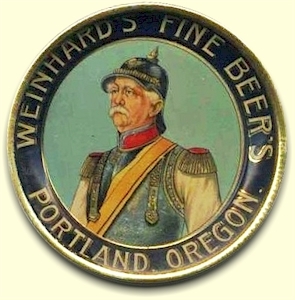 However their were still numerous accounts in California that sold Weinhard beer. 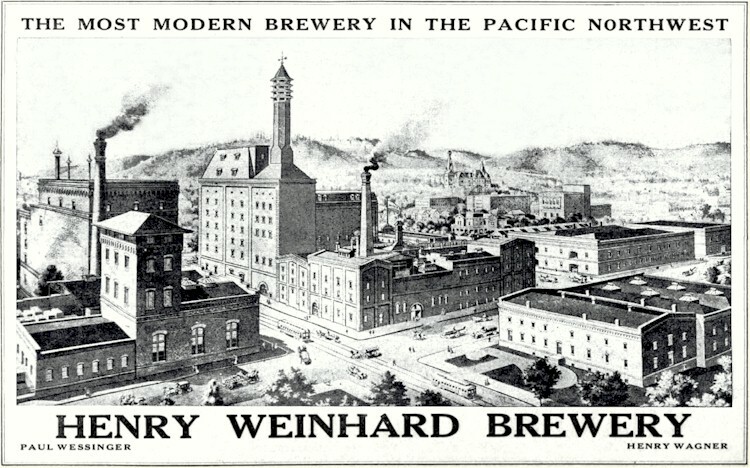 Consequently, their Weinhard Bottling Company in San Francisco commenced doing business as the Henry Weinhard Brewery. They didn't begin producing beer, but contracted with local breweries to produce Weinhard beers for their various outlets - like the Hof-Bräu Cafe. 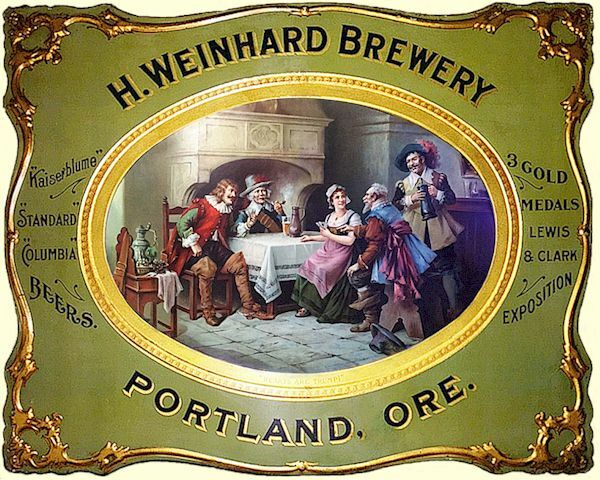 It's not known who they contracted to brew their beer, but Weinhard was soon to enter into a business venture with five local breweries, and one of those would have been the likely candidate. "Six San Francisco breweries, facing financial loss, or insolvency, through proposed legislation regulating manufacture of maltuous drinks, have pooled their interests into one association for the manufacture and distribution of beers and malts. The body is to be known as the Acme-National Brewing Company³. J.P. Rettenmayer, president of the Acme Brewing Company and head of the State Brewers' Association, is president of the consolidated companies. This announcement was made today by Charles O. Swanberg, president of the Merchants' Ice & Cold Storage Company, and a heavy stockholder in two of the affected concerns. The breweries included in the merger are: National Brewing Company, Henry Weinhard Brewery, Claus Wreden Brewing Company, Union Brewing and Malting Company, Acme Brewing Company and Broadway Brewing Company." Only two of the breweries continued as plants of the (renamed) California Brewing Association: the Acme Brewery, and the National Brewery. All of the other breweries ceased production and closed, but their parent companies continued to operate until they were all were forced out of business by national Prohibition on January 16, 1920. "The plant was devoted to the making of alcoholic drinks until 1916, since which time the production has consisted of non-alcoholic beer." "The company is also engaged in the manufacturing and jobbing of all kinds of soda fountain beverages and supplies, making fruit syrups and ginger ale, and maintains a cabinet shop, in which is made various kinds of confectionery equipment, counters, wall cases and showcases. It jobs soda fountains and all kinds of fountain accessories and has nine traveling representatives on the road, its sales territory including northern California, Idaho, Oregon and Washington." "The son (of Paul Wessinger), Henry W. Wessinger, attended Portland Academy, after which he entered Cornell University, at Ithaca, New York, from which he was graduated with the degree of Mechanical Engineer in 1910. He was connected with the Portland Electric Power Company until 1916, when he entered the Henry Weinhard Company, with which he has been identified to the present time, becoming president and manager in 1926." In December of 1918, the Henry Weinhard Plant bought out Puritan Manufacturing Company and thereby gained the rights to manufacture such popular, non-alcoholic beverages as Ras-Porter, Graport, Loganport and Cherriport. About this time they also began bottling apple juice/cider in addition to Appo their sweetened apple drink. This move was likely a response to the federal restrictions on sugar used in the production of soft drinks due to the war in Europe. 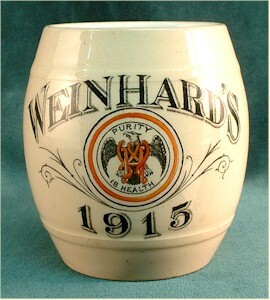 This stein, printed with only "H. Weinhard," is similar in color and font to a jug advertising: "Pure Apple Cider - Henry Weinhard" - which would suggest that both the jug and stein are ca.1918. 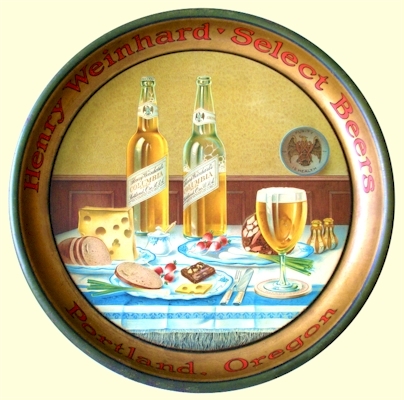 "On January 1, 1928, the brewery activities of the Weinhard company were merged with the Portland Brewing Company, under the name of the Blitz-Weinhard Company, the Henry Weinhard Company doing all of the bottling and acting as sales agent for the other concern. Mr. Wessinger is treasurer of the Blitz-Weinhard Company and devotes his attention closely to the interests of the business of both concerns." 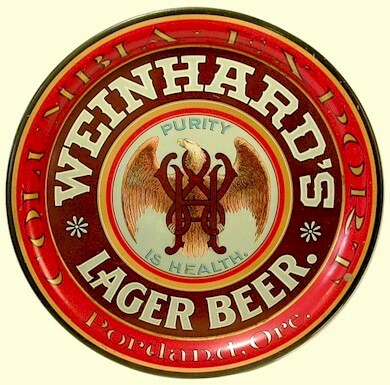 Upon Repeal, on April 7, 1933, the Blitz-Weinhard Company resumed the production of beer and began a new chapter in the Weinhard story - which is beyond the scope of this article. However, it's worth mentioning that the old City Brewery remained family-owned until Henry Weinhard's great-grandsons, William and Frederic Wessinger, sold the brewery to Pabst in 1979. ¹ The Brewery also contributed $10,000 to the Exposition project. ² The Pacific Building still stands, and houses the flagship Old Navy Store, the Palomar Hotel and the Fifth Floor Restaurant & Lounge. ³ The Acme-National Brewing Company designation was dropped in favor of the California Brewing Association. A special thanks to Bryan Anderson for the Portland Beer label, plus the Pale Beer embossed display card. And thanks to Mark Morehead for the image of his 1918 "H. Weinhard" stein. Copyright © 2013 ~ All Rights Reserved.